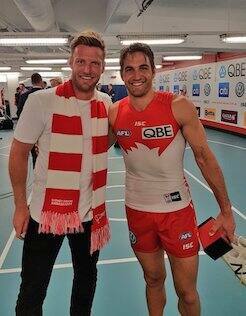 Recently retired Australian tennis star Sam Groth catches up with Sydney Swans captain Josh Kennedy post-match. This week we speak to Swans ambassador and recently retired Australian tennis star Sam Groth, whose love for the Club is as massive as his serve. It all started when Sam Groth was just a little kid, growing up in the southern NSW town of Corowa. It’s AFL footy territory, and there were some famous names in town. Swans coach, and former North Melbourne star, John Longmire, hails from Corowa. And the local jewellery store was owned by a man named Albert Lockett, uncle to none other than the greatest goal-kicker of all time, Tony ‘Plugger’ Lockett. In September 1996, when Groth was eight years old, the Swans made a grand final for the first time since 1945. He’d been a Swans fan all his life, but that was his first strong memory. He recalls driving down to Melbourne for games with Albert Lockett, and the excitement of watching the Swans take on North Melbourne in that grand final with Plugger at the helm in the goal square. Sadly, the Swans lost that day, but that didn’t dampen young Sam’s love for the team and especially the team’s big forward. “I remember going in the rooms after games and seeing the players, especially Plugger. He just seemed so massive to me and he had such an aura about him, but I had this link to him through his uncle and his mother Liz who we’d also sit with,’’ Groth said. In 2015, Groth made the third round at both the Australian Open and Wimbledon and that year was ranked 53rd in the world. But his first love as a boy was footy, and he was good at it. He made representative squads in his teenage years but then opted to pursue tennis professionally. He spent 10 years on the international circuit and that meant he was on the road for most of the football season. “I had an AFL Live international subscription so was up at all hours of the night watching the Swans play,’’ Groth said. He watched the 2012 premiership from a hotel room in Las Vegas while he was there for a tournament. Now he’s retired from tennis, Groth is hoping he can be at the MCG to see the next premiership in person.